Background: Enzymes, proteins, receptors, ion channels and DNA/RNA are among drug targets. DNA-interactive drugs involve alkylation (temozolomide, chlorambucil and cyclophosphamide), intercalation (doxorubicin), DNA breakage (nitroimidazoles), oxidative degradation (bleomycin), code-reading (polyamides and triplex-forming molecules) and stabilization of topoisomerase-DNA complexes (doxorubicin, etoposide, mitoxantrone and SN-38) and G-quadruplexes (perylene, cationic porphyrins and telomestatin). As a non-B DNA structure, G-quadruplexes may form at single-stranded 3'-overhangs of telomeres and the promoters of proto-oncogenes. Telomeric and non-telomeric oligodeoxynucleotides in G-quadruplex conformation exhibit antiproliferative activity against tumour cells and induce apoptosis. However, Gquadruplex motifs are widespread around the chromosome translocation breakpoints in lymphoid cancers. Conclusion: Hairpin/cruciform or slipped-strand DNA structures extruded by inverted and direct repeats, respectively, could be involved in the induction of translocations, deletions, isochromosomes, duplications and inversions in human cancers and genetic diseases as well as the expansion of short nucleotide repeats in hereditary neurological diseases. In addition, there is a significant association between long inverted repeats (LIRs) and the breakpoint regions of gross gene deletions in human cancers and inherited diseases. 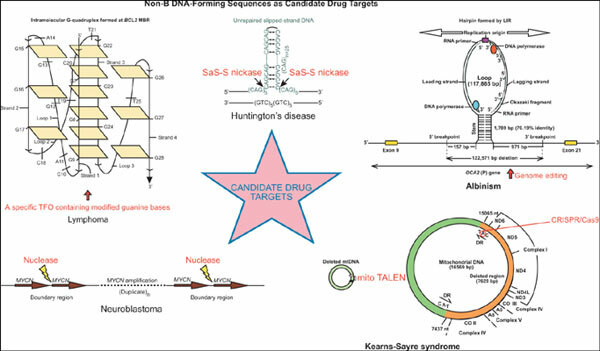 Thus, this review will focus on non-B DNA structures as candidate drug targets against structural chromosomal instability in various diseases. Non-B DNA structures, repetitive DNA sequences, candidate drug targets, structural chromosomal instability, cancer, genetic diseases.